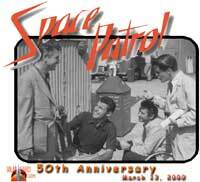 Space Patrol debuted on March 9, 1950 as a fifteen minute show on KECA-TV in Los Angeles, a little over 6 months before the Tom Corbett series began. The first half hour Saturday show began on December 30, 1950 and lasted until February 26, 1955. The fifteen minute shows were kinescoped for broadcast outside of the Los Angles area within a week or two of the California broadcast. In June of 1952 the Saturday shows were broadcast live from coast to coast and the daily 15 minute shows continued to be broadcast on the West Coast for at least three years after the coast to coast syndication had ended. The shows creator, Mike Moser, was a Navy veteran of World War II who had trained hurricane-hunter squadrons. In a 1952 Time article, Mr. Moser said the show was inspired while he was flying over the Pacific and thinking about the universe. He wanted kids to grow up with the same sense of wonder for the future he had experienced during his childhood with Flash Gordon and Buck Rogers. The show was also broadcast twice a week on the radio during the run of the TV show, resulting in a hectic schedule for its crew. 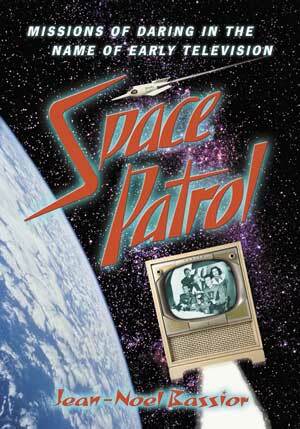 A week of Space Patrol involved 5 local 15-minute TV shows, 2 radio shows, and the half hour Saturday network show. An estimated total of 210 Saturday half-hour shows, 200 radio programs and at least 900 fifteen minute TV shows were broadcast during the run of the show. The shows ran consecutively from March 9, 1950 till July 2, 1954. In addition to the TV & Radio shows, Space Patrol appeared in a short two issue comic book run by Ziff Davis (Summer 1952 & November 1952). The stories were scripted by Phil Evans with both covers drawn by Norman Saunders with some of the interior artwork done by Bernie Krigstein. Norman Saunders artwork for Ziff Davis had a great sense of wonder reminiscent of the great pulp SF covers of the 30's,40's and 50's. This page is still under construction and will be for some time. Cadet Ed would like to thank Cadet Jean-Noel Bassior for her help with research and information about Space Patrol and for her willingness to take time to write about one of our favorite subjects.... Space Patrol . After many years of research and interviews with both fans and those who worked on the show, Jean-Noel's Space Patrol: Missions of Daring in the Name of Early Television is now available. Click on the thumbnail to enlarge the book cover. The scan may not show the detail, but I bet the Space Patrol crew are looking out of the Terra V port. A chapter from the book was published in the October 2003 issue of FilmFax titled - The Search for the Ralston Rocket. The Ralston Rocket was and remains to this day a great focus of fan interest. Jean-Noel has done a lot of research into the history of the Ralston Rocket and has some interesting information about the final resting place of the Rockets. But the rocket is only one small piece of the book's history about the Space Patrol show. Cast members, family members of the cast, workers and fans have contributed to the research of the book, including Cadets Chuck Lassen,Jack McKirgan and many others who remember and loved the show. The book can be ordered from Amazon.com now. You may read samples from the book at the Space Patrol Book website. Thanks Jean-Noel. Post your comments,questions,answers on the Solar Guard Bulletin Board. Introduction to Space Patrol - What better way to introduce the Space Patrol then in pictures of the world of those daring heroes of the future. The "pictorial" introductions to Space Patrol were developed from the Stori-View 3D slide reels of the 1950's. Space Craft of the Patrol - The Ralston Rocket,Terra IV, Terra V and others. Last known copyright holder of Space Patrol © is Wade Williams Productions of Kansas City Mo.